Signature Culinary Solutions in collaboration with sister company, Chef Brandz, specifically focuses on the industrialization of recipes and manufacturing of high quality products for our clients. We produce and deliver fresh and frozen food, 7 days a week, 365 days a year. 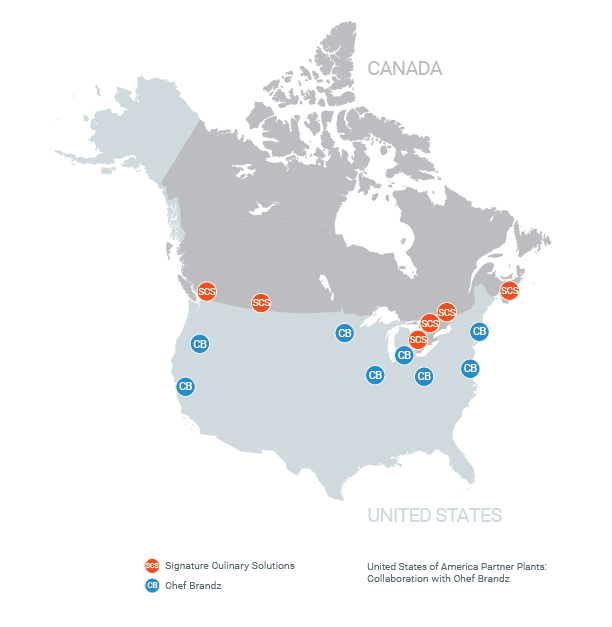 Our processing plants are currently located in the following Canadian and USA locations, as indicated. Signature Culinary Solutions currently operates its own refrigerated vehicles in addition to utilizing a third-party distribution service, in order to deliver fresh and frozen products 7 days a week, 365 days a year. Larger projects may warrant the operation of a Signature Culinary Solutions’ dedicated vehicle(s) to be solely assigned to servicing specific client needs, which will determined within initial project discussions. We take great pride in our consistent and uninterrupted supply. Always prepared, Signature Culinary Solutions maintains stringent contingency procedures, complete with additional inventory and back-up supplier rosters, to avoid any downtime or interruptions for any reason.